Much was made last week about the departure of Saturday Night Live stalwart Bill Hader, and still more was made when word broke just before (or, perhaps, during) last Saturday night’s show that longtime cast member Fred Armisen would be joining Hader in exiting Studio 8H. Add to that the speculation that Jason Sudeikis is a part of the exodus – only a year after show centerpiece Kristen Wiig left the show – and we seem to have a full-fledged panic. Hader, Armisen and Sudeikis – who accrued twenty-eight seasons of combined service on the show – will certainly leave a gaping hole, having portrayed such vital characters as President Obama, Vice President Biden, James Carville, David Patterson, the Devil, and, of course, Stefon. How could the show possibly survive such a great loss of talent, three of their leading men, a trio of go-tos. Losing one, sure, it happens. But all three, plus the farewell of Head Writer Seth Meyers at mid-season? Won’t that just be the end of SNL? No, no it won’t. Despite some histrionics that seem to point to the opposite sentiment, the show will persist just fine. In fact, this is the circle of life for Saturday Night Live (it’s just Saturday Night Life?). Granted, if Sudeikis does, in fact, join Hader and Armisen, then you would have a more severe than normal bloodletting, but it’s not a lethal loss. The show has always and will always subsist on the infusion of new, exciting, eager talent. This season SNL was without Kristen Wiig, who seemed to have shouldered the load for so many seasons (to the show’s detriment, in our opinion) and it went on unencumbered in her absence, bolstered by noteworthy performances by newcomers Kate McKinnon and Cecily Strong, two fantastic young talents who might have not had the chance to breakout if Wiig was still around. And the show has weathered the loss of every great star during its history, with someone waiting in the wings to step up. Chevy Chase leaves after the inaugural season and Bill Murray gets the call. Farley and Sandler leave and we get Will Ferrell. Ferrell leaves but Armisen and Will Forte join the show and Amy Poehler receives more screen time. Every time SNL closes a door it opens a window, a window cracked just wide enough for a talented young sketch comedian to crawl. And it will be the same with this loss, which should better be classified as a transition than a remaking; it’s certainly nothing as a dramatic as the turnover before Ferrell’s first season. Bobby Moynihan, who had a stellar season with his “Weekend Update” appearances as Drunk Uncle and Anthony Crispino, has already been doing much of the heavy lifting, appearing in cold opens, monologues, parodies, and Update visits, performing as straight man as well as Guy Fieri. He’s certainly more than capable of being the show’s anchor in his sixth season. Likewise of Taran Killam, whose squared-jaw good looks and Baryshnikovian dance moves make him possibly the show’s most valuable not-yet-ready-for-prime-time-player, and who is due for his breakout season. Then you have Kenan Thompson, who has only improved with age, as he shook off his All That trappings and grew into a reliable SNL presence, and Tim Robinson, who had a strong, confident debut season, and Jay Pharoah, who is an incredible mimic but still looking to find his groove, despite getting the nod to play Obama this season. Not to mention the fresh new talent they might recruit to replace the departing cast members. And add to that the terrific female players that we already discussed, and you have a dynamic, hungry, inspired cast ready to make their mark and define their era on SNL. If the show is guilty of anything over its last 38 seasons, it’s of being lazy, relying on the old standbys. With the old guard on its way out, SNL just might not have that luxury next season, and we might be better off for it. Yes, we had to say goodbye to Stefon, and that was very, very sad. But Stefon had to move on, and so do we. Because there’s another Stefon out there. There always is. We just don’t know him yet. Late at night last week we were absent-mindedly watching a rerun of The Office (“The Delivery, Part 2“), which is something we don’t often do. However, our decision paid dividends when something caught our eye during a commercial break, an apparent allusion to another NBC Thursday Night comedy. 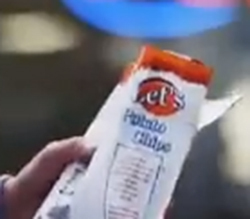 Thirteen seconds into a Honda Accord spot featuring two preternaturally mature, Wes Anderson-esque children, we just barely noticed the distinct markings of a potato chip brand recently featured on Community, that being the preferred chip of Troy, Let’s. 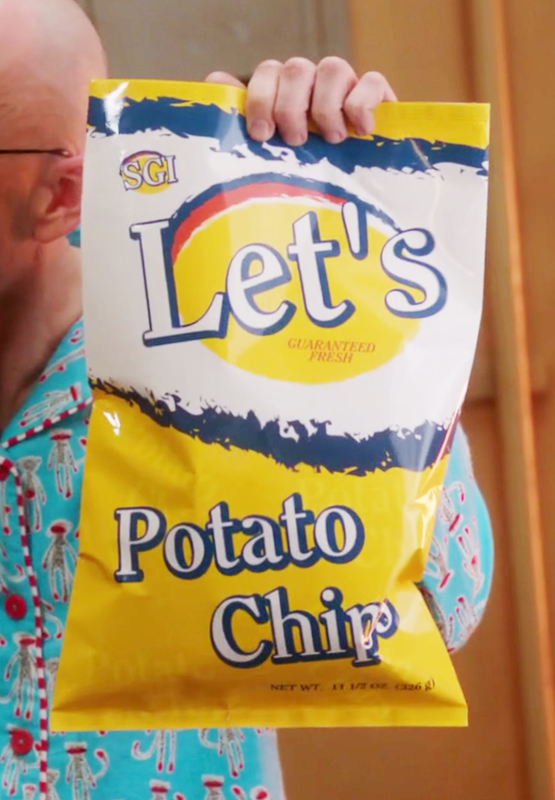 Let’s Chips has actually popped up several times in the show, including in Season 4 when it was reviewed during the end credits tag by Greendale’s foremost nonagenarian and Korean War Vet (North Korean side), Leonard. The verdict was a firm “Buy,” advice that was clearly heeded by Dean Pelton and Troy. 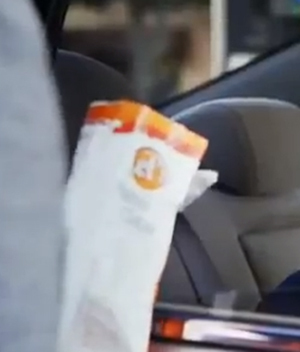 Britta, however, insists on sticking with her far inferior “Spwingles” brand chips, driving a potentially insurmountable wedge between her and Troy. So what gives? Is this a wink to Community? A subliminal message intended to subvert viewers into watching the show against their will, thereby giving the series hope for a fifth season? Or has the Community soundstage already been shut down and dismantled, the props sold off to highest car commercial bidder? Should we expect to see Yard-Margs from Skeepers in an Daewoo commercial? Or, perhaps, this a clue, an easter egg, showing that the world of Greendale is far greater than we ever imagined. Allergy Season: Did Ron Swanson Perjure Himself? On last week’s Parks and Recreation Ron Swanson swallowed his pride and disdain for modern medicine and agreed to visit a doctor after contracting a from his girlfriend’s little daughters. However, when Ann Perkins (who is still a nurse when it suits the story) asks Ron some basic health questions we couldn’t help but be surprised at one of his answers, as it seemed to contradict something he said to his Swanson Scouts in Season 4. Very curious. Especially since we know that Ron hates lying almost more than anything (the only exception being skim milk, which is milk that is lying). Perhaps this calls for another deposition. Absent, or maybe just ignored, among all the words committed to The Tonight Show plan for succession has been a discussion about what will happen to The Late Show with David Letterman and its lead-out The Late Late Show. Like Jay Leno, Dave has been at this game a long, long time. Unlike Jay, Dave seems to not care about ratings (possibly because he knows he’s likely to lose), does not appear to be that concerned with being well-liked (which has worked to his advantage, and has paradoxically made him more revered) and is not in any imminent danger of being forced out by the network brass, basically been given carte blanche by CBS to stay as long as he wants and, essentially, to do what he wants. When one jump-starts a late night franchise from scratch, we guess he’s granted some amount of immunity. But, unlike Jay, Dave doesn’t have a younger, hipper, potential replacement nipping at his heels, which makes the future of The Late Show even murkier. While Craig Ferguson has built up a small but very loyal, impassioned following, and has received rave reviews for years from critics, we don’t have the sense that he’s long for his job, or at least eying the 11:35pm slot. In that small studio (we’ve been there) in CBS Television City, without a house band or announcer, Ferguson can deliver long, meandering monologues (verging on soliloquies) straight to camera, as if the audience and the viewing public wasn’t there, and engage in extended, intimate irreverent conversations with a diverse pool of guests. The Late Late Show interviews occupy that space between the celebrity shilling meant for the masses that one can observe on most late night talk shows and the quiet, introspective, one-on-one interviews conducted without a studio audience on past programs like Tom Synder’s Late Late Show. Sometimes it feels like The Late Late Show is performed for the studio audience, and then broadcast to millions of homes as an afterthought. Which isn’t to say that Ferguson couldn’t do a more traditional, more accessible late night show if he were bumped up to the main slot, we’re just not sure he wants to. Signed through 2014, when Letterman’s current contract runs through, it feels in some ways like he’s only there as long as Dave is, his relaxed, low-key, mischievous Scottish wit a complement Dave’s acerbic bitterness. But if not Ferguson, then who?